The price you found is 22% lower than this hotel's average rate of $663/night. 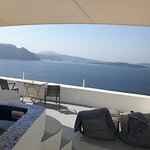 My wife and I just spent 2 nights, 3 days in Santorini and stayed at Ambition Suites. 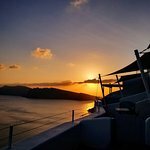 I'll admit I was a bit skeptical going in with the beautiful photos and all 5 star reviews, could it really be that good? Well it is and then some. We arranged to have an airport pickup for our flight that got in at 7:45am. George was there waiting for us when we arrived. When we got to our hotel our room wasn't ready but Iveta welcomed us in, took our bags, and gave us drinks, all right around 9am. We were told our room would be ready around 10:30 so we went for a walk around the beautiful Oia. When we got back, Iveta brought us to our room and our jaws dropped. 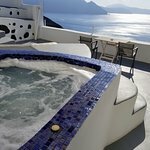 The private balcony with hot tub overlooking the caldera has got to be one of the world's most beautiful sights. Especially at sunset it's just stunning. Iveta brought us into the room and showed us all the little nifty things... the nespresso machine, the complimentary drinks in the fridge, how to fill out the breakfast menu, how to use the hot tub, etc. With the hotel only consisting of four suites, it's the perfect mix of personal service and privacy. The breakfast is another amazing feature. 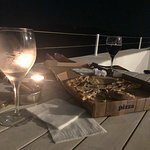 The night before you fill out the breakfast menu which has plenty of options and it's all set up on your balcony at your desired time. 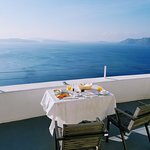 The hotel is also in a perfect location, right on the edge of Oia. There's lots of restaurants and shops right outside the hotel but it's not located in the narrow middle part of Oia which got really packed on days where cruise ships docked in Fira. The only warning I should give is there's a lot of stairs you need to go up and down to get from your room to street level, but if you're not good with stairs you might want to rethink going to Santorini in the first place. All in all this place is perfect from start to finish.